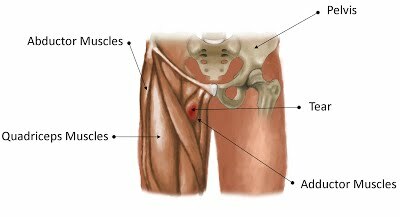 Strain of any muscle is painful, especially groin. Our homeopathic protocol offers Fast natural cure for groin strain which can provide huge relief in 24 hrs and cure in 7 days in most cases. All other treatments only block the pain (pain killers) but do nothing to cure. Our homeopathic protocol reduces pain and provides cures at the same time. Lets first see what is a groin strain. A groin strain is an overstretch or tearing injury to the muscles of the inner thigh. Groin strains make walking, lifting the knee, or moving the leg away from or toward the body difficult and painful. Groin strains can occur from overuse of the muscles, or from a sudden contraction of the muscles. Wait for 12 hrs, then take a dose of Ruta 200. Apply Arnica cream to the affected area, 3-4 times a day. Within 24 hrs, you will see substantial reduction in your pain. Continue daily activities avoiding movements which cause pain in the groin. STOP all forms of exercise & sports for a few days till cured. Take one dose of Ruta 200 after 3 days of the first dose. If your pain persists, take a dose of Ruta 200 every 3rd day till cured. Continue applying Arnica cream till you are cured. You can Contact Us for any further details or help or you can use our FREE Smart Remedy Finder to find the right remedy within minutes for many injuries & illnesses along with detailed prescription guidelines on how soon to expect improvement, when to repeat the dose etc. This protocol can help in all types of groin strains. If you suspect Grade-3 strain, get emergency medical help in addition to the protocol above.